Chris Morris played a key role in helping the Delhi Capitals restrict Kings XI Punjab to a below-par total on a batter-friendly wicket at Mohali on Monday (April 1). The South African all-rounder got rid of KL Rahul, David Miller and Ravichandran Ashwin in the first innings. His spell of 3/30 derailed Punjab's surge with the key wicket of compatriot Miller hurting them in particular. With those three wickets, Chris Morris now has 32 wickets for Delhi Capitals. He is Delhi's sixth most successful bowler in terms of wickets taken and the second best among current members of the squad after Amit Mishra (93 wickets). Only eight bowlers have taken over 30 wickets for Delhi in the history of the IPL. A capable bowler with a fine yorker and good pace variations, Morris is a natural wicket-taker who is handy on any surface. At Mohali, he removed Rahul with a ball angling into the opening batsman and later did Miller in with a slower delivery. Both wickets came at crucial times for Delhi. Rahul was just about starting to fire when Morris got the big breakthrough for DC in his first over. When he returned to the attack in the 17th over, he prised out a well-set Miller by deceiving him with a slower ball. He added the wicket of Ashwin to register his 15th three-plus wicket haul in T20 cricket. This was the second time Morris has dismissed Miller in his T20 career. Miller's strike rate against Morris (103.85) is also not as impressive. 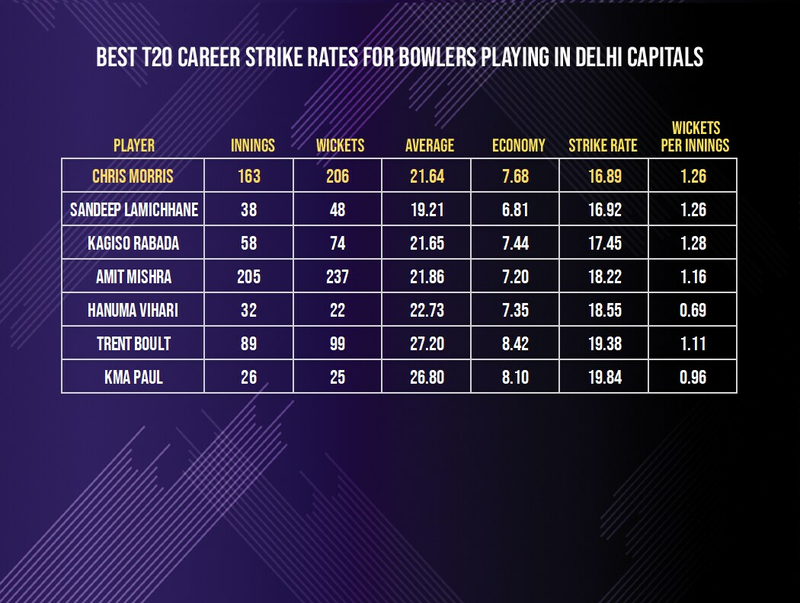 Morris' career numbers in the format make him Delhi Capitals potent wicket-taking threat. In 163 bowling innings’, Morris has 206 wickets at a strike rate of 16.89. Sandeep Lamichhane with 48 wickets in 38 matches comes next. Morris also takes 1.26 wickets on average in an innings. His career T20 wickets puts him next only to Amit Mishra in the Delhi side. While his economy of 7.68 is slightly on the high side, his wicket-taking skills make up for it. Add in the fact that he can chip in regularly with the bat and Morris becomes a key element in DC's plans for the season.